Concrete Finishes Enhance Luxury Apartments Hyde Concrete, Annapolis, Md. Concrete Microtopping Transforms an Old Horse Barn Envision Concrete, Escondido, Calif. Decorative Overlay Transforms a Wood Deck Blevins Hardscapes LLC, Eubank, KY. Decorative Concrete Floor Gives Company a New Image Atlanta Concrete Artist, Alpharetta, Ga.
Metallic Concrete Floor Coating Adds Dazzle to Parade Home Silverline Systems, Boise, Ida. Industrial Concrete Floor Coating Keeps Firehouse Ready for Action Mile High Coatings, Fort Collins, Colo.
“Wow” Factor Flooring A-Plus Concrete Construction, Fresno, Calif.
School Pride in Concrete Concrete Cosmetics and B&B Overlays in Billings, Mont. It’s All in the Details Custom Concrete Solutions, West Hartford, Conn. When to Use a Polishable Overlay Extreme Measures Construction in Beaumont, CA. 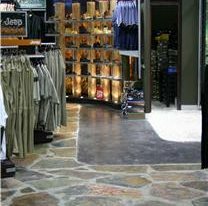 Surgical Center in Naples, FL Gets Epoxy Floor Coatings Innovative Concrete Surfaces in Naples, FL. 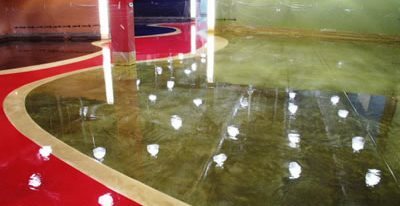 Epoxy Floor Coating Fixes Mistakes of Previous Contractors Innovative Concrete Design in Indio, CA. Scored and Stained Polymer Overlay Gives Fresh Look To ConAgra Foods Headquarters Stephen and Smith Company in Nebraska. Five Lessons Learned from a Restaurant Remodel KW Specialized Concrete in Olympia, WA.